The helices don’t auger the soil but rather screw into it with minimal disruption. 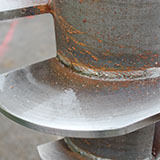 The helical plates rest in the piles’ first section, referred to as the “lead” or “starter” section. 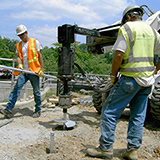 Drivecast piles use sections — or shafts — made from structured steel and have displacement modules at regular intervals. The modules utilize an innovative soil displacement methodology that helps eliminate vibrations and minimize site disturbance. When building a new home, short-term decisions usually include what floor tile to use in the kitchen or which coverings to put on the living room bay windows. 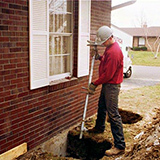 Few homeowners think about which type of foundation offers the best long-term stability. In a February report, the U.S. Department of Commerce revealed that construction spending was at an 11-year high. 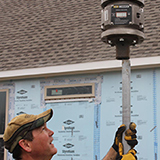 The new homes, roads, buildings, and infrastructure springing up across the country are expected to boost local and state economies, which could lead to new and exciting opportunities for helical piles. 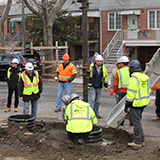 The cost-saving benefits of helical piles are evident as early as the bidding process. 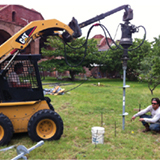 For instance, with satisfactory soils information, contractors can offer precise lump-sum bids, regardless of the helical foundations’ length.Those proposals are often as competitive as they are accurate, thanks to simpler and safer installation methods. 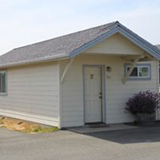 When seaside cabins in Gold Beach, Oregon, began to noticeably settle, it was cause for some concern. The properties had been built on a landfill where much of the fill’s contents were uncontrolled and unidentified, and the property owners needed to act quickly in order to prevent any further sinking or damage to the property. Dry Tortugas National Park is a remote cluster of islands situated nearly 70 miles off Florida’s southern coast in the Gulf of Mexico. The park houses Fort Jefferson, a colossal six-sided fort built in the mid-19th century that, despite being unfinished, happens to be the largest masonry structure in the Western Hemisphere. As the CHANCE® Drivecast™ screw displacement pile is rotated into the ground, it compresses the soil laterally, creating a void which is immediately filled with grout maintained in the reservoir. 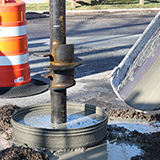 The schedule 80 centralized shaft replaces the rebar cage as column reinforcement. 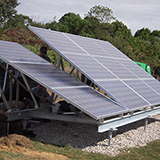 Technological advances have turned solar power into a viable alternative energy source on both the individual and industrial level. People everywhere are discovering that the installation of solar panels on their homes can significantly diminish their carbon footprint and slash domestic energy bills. 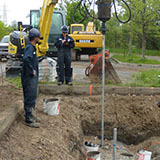 The CHANCE® Drivecast™ screw displacement pile underwent three installations in the northeast, each achieving significantly positive test results. 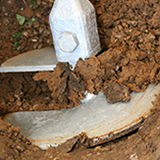 As a helical anchor drills deeper into increasingly dense or hard soil, the principle predicts an increase in installation energy or torque. Also, the higher the installation torque, the greater the axial capacity is of the installed anchor.